Originally published by Industrial Workers of the World (IWW). The CNT branch at the Port of Barcelona called for a 3-day strike beginning on February 15th in order to force the company to re-hire 3 of its members who had been fired for refusing to do work outside of their job description. After just 1 day on strike, they have forced the company to cave. The company and the union had previously come to a preliminary agreement to reinstate these three workers, but during a meeting on February 12th, the company tore up the agreement without warning. The workers had warned the company that they would not back down, and they didn’t. The union immediately walked out and gave the green light to a 3-day strike, which was ratified by a workplace assembly the next day. The strike gained strong support from many unions, social movements, and even a few political parties in Barcelona, and began with a strong show of support on Thursday morning. All it took was one day, and the company caved, with the union declaring complete victory. Spain’s labor law has deep roots in the Fascist regime of Francisco Franco. Compared to the US, workers have some more protections. However, strikes in Spain are only legal when called by a union, and the reformist unions in Spain are even more closely tied to the state than they are in the US, through funding and subsidies. They do everything they can to drown discontent through bureaucratic paperwork. Workers who strike without a union can be easily fired, a severe threat in a country with some of the highest unemployment in Europe. The CNT, on the other hand, promotes strikes and direct action as tools of struggle, and also believes that struggles should be managed in workplace assemblies rather than by union bureaucrats. Since the economic crisis in 2008 ruptured Spain’s welfare state, the business unions have led workers into one defeat after another, while the CNT’s militant model has led to a long string of successes and growth alongside militant independent groups such as “Las Kellys,” a group for hotel cleaners who have successfully organized to resist attempts by the business unions to negotiate bad deals on their behalf. The CNT branch at the port of Barcelona has an exemplary history of struggle, both within the workplace and in the broader society. They established themselves at the port through fierce and relentless struggle over workplace issues, and the latest threat from the company was in fact an attempt to get them to negotiate away an earlier victory. They also played an outstanding role during the recent government repression in Catalonia and the anarchist-led General Strike which followed. When the government began trying to sneak police into the port through disguised cruise ships, the CNT dockworkers refused to dock the ship, and alerted the rest of Barcelona to the threat. They continued to report on the militarization of the port, and agitate port workers to struggle against it. The government and employers certainly took note of this and may have been aiming to repress them. When the anarchist and independent unions in Catalonia called for a general strike to protest against the repression, the workers at the port of Barcelona held an assembly and voted unanimously to join the strike. This may have been one of the workplaces where the strike had the biggest impact. Stan Weir, himself a dockworker from Oakland and a supporter of militant unionism on the Spanish waterfront, always said that firing should be thought of as “economic corporal punishment.” Firing is the ultimate power that an individual employer has. In many workplaces, there’s no recourse, when you’re fired, you’re gone – something we’ve all experienced. In a workplace with a business union, you might get an official to file a piece of paper, and months or years later, your case might get discussed by a bunch of officials sitting around a table, with no connection to the struggles at that workplace. What we need are unions that know how to keep their struggle at the point of production, run by the workers, and that aren’t afraid of using militant tactics to win. The CNT branch at the port of Barcelona are a great case study of what the CNT is doing right by combining militant and resilient workplace organization with a commitment to broader working-class struggles against capitalism, and ultimately to libertarian communism. By doing this, they have been able to play an increasingly significant role in helping to unify and spread working-class struggles in Spain. 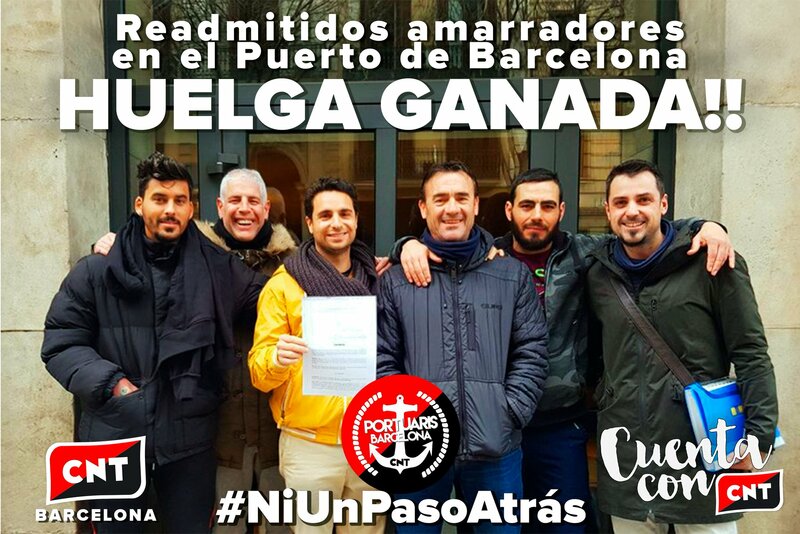 Victories at individual workplaces, such as the port of Barcelona, can have a huge effect on the confidence of workers to engage in larger struggles, which can then give a sense of strength to the day-to-day organizing in workplaces and communities. We’ll see the other side of this coin during the Feminist General Strike on March 8, which the CNT is working with autonomous feminist groups to organize across all of Spain. Crucially, because the CNT is a union, they are able to legalize the strike and protect anyone who will take part. There is significant mobilizing happening for this, and it could be a huge step in Spain and a great example for the rest of us. There is a lot we can learn in North America from combining this approach of day-to-day organizing in workplaces and communities with a commitment to anti-capitalism and broader working-class militancy. We have to show that we have a real strategy to win immediate gains and build power for bigger ones. The recent strike at Burgerville is a great example of where to begin. Juntas paramos – juntas avanzamos! Let’s shut it down together – let’s advance together!